Wellington has had an advertising campaign for some time encouraging people to "Go the trains"
No it wasn't that we had a pile of sleeper-in staff. At least one of them took 3 hours to do the normal 30 min ride from Hutt. 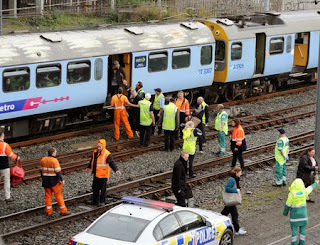 A Paraparaumu train derailed at around 7:45 this morning between Kaiwharawhara and Wellington. Given the time there was a huge backlog of people to be taken off trains and onto buses to get to work. Apparently there were real challenges - for example people who needed to go to loo had a challenge because you weren't meant to get off train without police supervision due to electrified lines.